In fish species the basic mechanisms of bone development and bone remodeling are not fully understood. 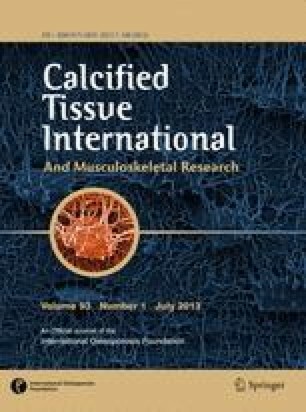 The classification of bone tissue in teleosts as cellular or acellular and the presence of transitional states between bone and cartilage and the finding of different types of cartilage in teleosts not previously recognized in higher vertebrates emphasizes the need for a study on the accumulation of the Gla-containing proteins MGP and BGP at the cellular level. In the present study, polyclonal antibodies developed against BGP and MGP from A. regius (a local marine teleost fish) and against MGP from G. galeus (a Pacific Ocean shark), were tested by Western blot for their specificity against BGP and MGP from several other species of teleost fish and shark. For this purpose we extracted and purified both proteins from various marine and freshwater teleosts, identified them by N-terminal amino acid sequence analysis and confirmed the presence of gamma-carboxylation in the proteins with the use of a stain specific for Gla residues. Each antibody recognized either BGP or MGP with no cross-reaction between proteins detected. All purified fish BGPs and MGPs tested were shown to be specifically recognized, thus validating the use of these antibodies for further studies. This work was partially funded by grants from the Portuguese Science and Technology Foundation (Praxis BIA 469/94; BIA 11159/98; POCTI/CVT/42098/2001) and US Public Health Service, Grant AR25921 from the National Institutes of Health. DC Simes was the recipient of a PRODEP fellowship awarded by the Portuguese Ministry of Education. N-terminal amino acid sequences for DrBGP, HdBGP and PgMGP were submitted to SWISS-PROT database and were assigned accession numbers P83238, P83473 and P83347, respectively.